Each day, during circle time, crown a king and a queen for the day. Determine a privilege for the king and the queen. Throughout the week, children will become knights and princesses. Each day, during circle time, crown a king and a queen for the day. Determine a privilege for the king and the queen (example: they are exempt of cleanup, they may stay awake at naptime, etc.) A model of a crown to be crafted by the children can be found in the crafts section. Transform yourself into a king or queen and welcome your little knights and princesses into the royal family. Have children kneel down before you. For the princesses, hand them their crowns and declare: "I make you a princess. For this week, you shall be called Princess (child's name)". For the knights, touch their shoulders with a cardboard sword and declare: "I make you a knight. For this week, you shall be called Sir (child's name)". We suggests an imaginary game to begin each day. (Open thematic letter - knights and princesses). Print the letter. Prepare a flamboyant box (silver or gold) to represent a treasure. Place the box in an easy to find place in the daycare. Once they have found it, read them the letter and follow the instructions throughout the week. Place a chair covered with red fabric in the daycare. It will be the throne. Lay out a red carpet in front of the chair. Hang a veil over the throne and set vases with flowers on each side of it. You can prepare baskets of plastic fruit. The pictures may be used as a memory game or to spark a conversation with the group. Use them to decorate the daycare or a specific thematic corner. 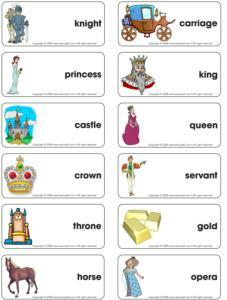 (Open picture game - knights and princesses) Print, laminate, and store in a "Ziploc" bag or in your thematic bins. Print the Educatall crown model and have children decorate with pearls, shiny beads, ribbons.... Aluminum paper is perfect for shiny crowns. A large box (refrigerator or appliance box) easily becomes a castle. It can be used as a closed quarter or used only to make a wall to mark off the area. Children will love decorating it! Different fabrics such as silk, fur, satin, etc. Books about castles, princesses, knights, medieval times! They are easy to find at your local library. You may also want to ask parents to loan some. A treasure hunt. Children must find all the gold pieces along their way. Knights' duel with foam swords! Children will want to do this over and over again. If they succeed in making their opponent's sword fall to the ground, they will be king for the day! Castle Fight: two teams, two castles, and lots of crumpled pieces of recycled paper! Just for fun. Bin filled with straws. Children search for precious stones. With children's help, make a dragon fire salad! Simply grate carrots and add grapes with mayonnaise or salad dressing. Children will enjoy! Using small and large marshmallows, build a castle you can eat afterwards! To color marshmallows, simply moisten and put them in an air-tight bag with Jell-O powder or juice and shake gently. Children love the look and the taste! This is a variation of the telephone game. Children sit in a circle. You have a message for the king. Whisper the message to the child sitting to your right. This child repeats it to the child sitting to his right and so on until the message has traveled around the circle. The last child to hear the message says it out loud to verify if the message is correct. One child is the princess. This child stands with his back against the wall. The other children are lined up against the opposite wall. The princess turns to face the wall and taps three times on the wall counting: "1, 2, 3, princess!" The other players move quickly towards the princess' wall but beware, as soon as the princess turns around, they must stop and remain still. If they are not completely still, the princess sends them back to the starting point. The first child to reach the wall becomes the next princess. Variation: 1, 2, 3, Knight! The game is the same, but the boys may prefer this title. The rose (a plastic flower or a pink scarf) is hung at one child's waist. Children move about the daycare. The object of the game is to steal the rose. The child who succeeds attaches it to his waist and continues moving about. The first child to have stolen the rose three times is the winner. Provide children with several sets of playing cards. Sit down with them to show them how to build castles. Draw a large square on the floor with colored electrical tape. Have two children stand in the square and hand them each a foam cylinder (used in swimming pools) to be used as swords. Children have a duel by hitting each other, sword to sword. Be sure to explain the rules clearly and supervise closely. Build a large stone castle for the princess. Instead of using traditional blocks, use sponges. Deposit 30ml of sand onto a paper plate. Grate a piece of colored chalk over the sand. The sand will gradually become the same color as the chalk. Use the colored sand to build a giant sand castle. 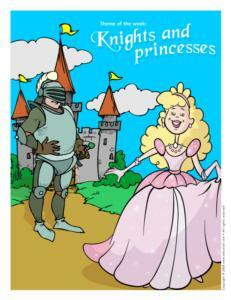 Invite parents to read a story you have chosen with their children related to the theme of knights and princesses. The next day, children can recount what they enjoyed most about the story. (Open knights and princesses - hunt and seek) Print and laminate. Children pick cards and search for the elements in the scene. 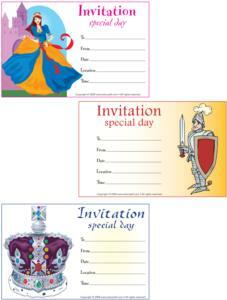 (Open Knights and princesses - story and memory game) Print, cut out and laminate. Place the cards face down on the floor. Children pick three cards each and invent a story in relation to the illustrations. Trick: To solidify the cards, glue each illustration onto the top of a frozen juice can. This is a color association game. (Open colorful castle) Print one copy per child. 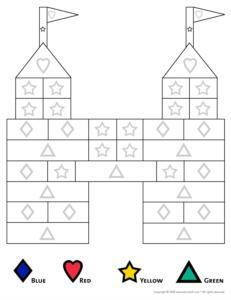 Children color their castle by associating the symbols to the correct colors. Children stand in a circle. Have one child leave the room and designate a conductor among the others. Each musical instrument will be mimed by the performers, with or without a violin, flute, piano, drum, guitar, or trumpet. The player who left the room must guess who the conductor is. (Open perpetual calendar - masked ball) For the occasion, we suggest you organize a fancy clothes day. 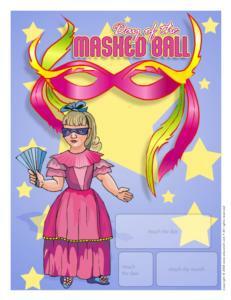 Your masked ball should include the usual; music, decorations, dancing, balloons, tablecloth decorated by the children, garlands, and crowns. A special snack could be composed of grape juice in plastic wine glasses, cheese and fruit brochettes, and a buffet for lunch. Don't forget to take pictures of everyone dressed up in their fanciest attire! You may want to invite parents to join you. There is no limit to your imagination. (Open invitation special day) Print and distribute. Find a large cardboard box. Decorate it together to make a float. Paint children's faces. Use lace, fabric, and ribbons as costumes for the princesses. Add capes to the knights. Give each participant a musical instrument and parade about the streets of your neighborhood. Place children two by two. One child is the horse and the other child (the knight) rides on his back. The knight places a certain number of fingers over the horse's head to form horns. Once the child playing the role of the horse guesses the correct number of horns, he becomes the knight. When you sing the words "My fair lady", the children forming the bridge lower their arms capturing another player under the bridge. The prisoner must choose a color (gold or silver) and stand behind the player who had originally chosen the same color. The game continues until all the children have been captured. Count the children in each team, gold and silver, and declare which team wins. Which stone will you remove? La la la, la la la la la. Which stone will you remove? La la la, la la la la la. We will take (Example: Julie's) stone la la la, la la la la la. We will take Julie's stone la la la, la la la la la. In this example, Julie would change groups and the game would begin all over again. The group which was second previously begins the second round. (Open king's and queen's crown) Print the model. Trace it onto a piece of cardboard covered with aluminum paper. Cut out and decorate with anything shiny you have on hand. Next, measure children's heads, adjust the size, and staple the crown. Drape children with lace curtains or pieces of fabric. Add jewellery. Paint small stars on their cheeks and add sparkles. Don't forget the crown! Use a black garbage bag. Cut it so it is open on the sides like a cape. Make a loose knot. Add the crown! (Print jewel models) Cut a 2 cm wide strip of colored construction paper. With glue, overlap the diamonds on the strip of paper, alternating colors. 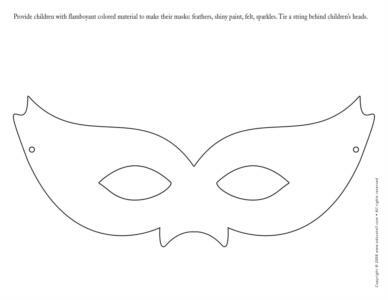 (Open mask - masked ball) Provide children with flamboyant colored material to make their masks: feathers, shiny paint, felt, sparkles. Tie a string behind children's heads. (Open sword) Cut out the model in very heavy cardboard. Children paint and decorate their swords as they wish. Arrange rubber bands around an empty styrofoam tray originally used for meat or vegetables. Children make music with their harps.